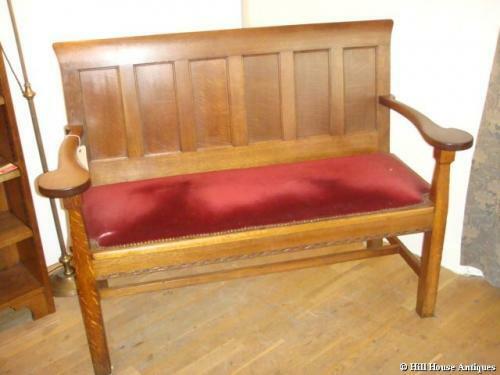 A rare oak Arts & Crafts hall seat or settle, by Arthur Simpson of Kendal, c1915. Curved shaped broad arms over tapering legs and very fine typical carving to seat edge. Arthur Simpson at his understated simple best. Examples of his carving/work are in Blackwell, the famous Arts & Crafts house in the Lake District designed by MH Baillie Scott. And of course Arthur Simpson was also very highly regarded by the British architect CFA Voysey (also a personal friend), who commissioned Simpson to make pieces to his designs. Provenance: originally removed from the Tower Bank Arms, a 17th century inn in the centre of Near Sawrey; a delightful hamlet midway between Hawkshead and the Western shore of Lake Windermere. Next door to the Tower Arms is Hill Top, the former home of Mrs Heelis, better known as Beatrix Potter. Beatrix Potter was a well known local, who often patronized the inn, and the Tower Bank Arms is familiar to generations of children as a small country Inn in The Tale of Jemima Puddleduck first published in 1908. Thanks to Helen Dunstan, for the above information.